Below is a detailed review of a terrorism book entitled Islam And Terrorism by Mark A. Gabriel. If I could recommend only one terrorism book, this is the one I would choose. It has more authentic authority on this subject than any other book I've found. Mark A. Gabriel, was born and raised in Egypt. He had memorized and could recite the entire Koran word-for-word by the time he was 12 years old. At the most respected university in the Islamic world, Al-Azhar, he earned his bachelor's, master's, and doctorate degrees there studying Islamic history. If you want an author with enough knowledge to write an authoritative Islamic terrorism book, this is the man. After his education, he was a teaching professor at Al-Azhar and he was also the imam of a mosque in Giza, Egypt. He knew the Koran very well, and the contradictions in it began to bother him. Some passages of the Koran preach peace and tolerance. Some passages preach violence and discrimination. That isn't necessarily a problem except for the fact that in a Muslim society like Egypt, everybody treats the Koran as if it is perfect in every way and the absolute word of Allah. Gabriel was told to preach only the nice passages. But even when only the compassionate verses are voiced in public, some people will read the whole book and because the society gives the book so much authority, some young men will feel compelled to follow all of Allah's commands. That's where Islamic terrorism has its roots. As far as these young idealists are concerned, their holy book is a terrorism book. It is a manual to follow. Islam and Terrorism is very clear and easy to read. It is full of excellent, authoritative information. For a terrorism book, the only drawback for someone with no religious affiliation (like me for example), is that the author is a born-again Christian. I think he still presents the Muslim world fairly, based on my reading of other works. But he is justifiably merciless with the Koran and the way the extremists use Islam for destruction. Gabriel himself was brutally tortured by his own government for suggesting to a student that the Koran may not be perfect. What is Islam's ultimate goal? Do all Muslims believe in jihad? If the Koran has so much violence and hatred in it, why do you hear it described as a religion of peace? What about those great quotes from the Koran? Why is there so much resistance and revolt in the Islamic world? Does the Koran justify the killing of civilians? Why are terrorists targeting Europe and the United States? And a question I've formed since I've started reading terrorism books is: What do devout Muslims do with the Koran's contradictions? For example, in some passages, women don't have to cover themselves, and in some passages they must. How does a good Muslim know which command to follow? Islamic scholars have made their decision: When two passages contradict each other, the later revelation overrides the earlier one. The earlier passage says women don't have to cover themselves, but a later passage says they do, so they must cover themselves. Case closed. This explains why a Muslim can say, "The Koran teaches peace," and yet a terrorist can justify his actions by quoting violent passages from the Koran. Both kinds of passages are in there. Fight and slay the pagans wherever you find them, and seize them, surround them, and lie in wait for them. Of course, if they convert to Islam, Mohammed recommends you cease fighting and stop slaying them. According to Gabriel, sixty percent of the verses in the Koran are about jihad, and they are almost all passages written later in Mohammed's life. Those who reject Islam must be killed. If they turn back from Islam, take hold of them and kill them wherever you find them. Okay, so what? Lots of books recommend violence. Even religious books. What makes the Koran unique is its political aspirations. "Jihad is carried out," writes Gabriel, "in order to achieve the ultimate goal of Islam — to establish Islamic authority over the whole world. Islam is not just a religion; it is a government, too." That is what makes Islam seem incompatible with democracy. And that's also why such a large percentage of Middle Eastern countries are Muslim. At one time, those countries were conquered and the population was forced to convert to Islam. Islamic governments were created that enforced the practice of Islam. Everybody had to do it (pray five times a day, cover their women, etc. ), except Christians and Jews. Sometimes they were allowed to practice their own religion if they paid a special tax. Over time, rich Christians and Jews paid their taxes. The rest of them either converted to Islam or left the country. So now we have countries where the people are almost all Muslim and the government is run according to Islamic law. Unfortunately that includes legally sanctioned discrimination against women and non-Muslims, and a general lack of human rights and freedom of religion. But wait a minute. Things aren't as bleak as they seem. People everywhere desire freedom. So the citizens of Algeria, Egypt, Syria, Turkey, Palestine, Iraq, Saudi Arabia, etc., have tried to create non-religious governments. But a non-Islamic government is an outrage to those who think the Koran is a book of direct commands from Allah. So there is a lot of revolt and fighting and killing. Jihad. Any Muslim who tries to create a non-Islamic government is a traitor to Islam according to these believers (and according to the Koran itself), so fighting their own governments is fighting for Islam in their minds. Shooting people is not the only way to wage a holy war. Lots of oil money from the Middle East finds its way into the U.S. and Europe — building mosques, printing literature, funding organizations, paying staff to do nothing but contact the media and talk to groups. They get on television when they can, talking about how Islam is a religion of peace. And lobbying for Muslim rights. And arousing negative public opinion against anyone who says something negative about Islam. And they keep gaining converts. The Muslim population is increasing — even in the free world. Deceit is not a sin in Islam if it is in the service of jihad. After September 11th, mosques and Islamic institutes in America posted signs saying "God Bless America" and "United We Stand." "In all fairness," says Gabriel, some Muslims "really did support America at this time. But other Muslims were doing what was simply expedient at the moment. They are a good example of Islamic politics in non-Islamic lands. These Muslims will lie and say things they do not believe at any moment as long as doing so would help Islam. Their loyalty is to Islam, not to the nation where they are living." In the philosophy of Islam, countries and boundaries don't really matter. "In Islamic law there are only two types of nations — a nation that is of the house of Islam or a nation that is of the house of war," writes Gabriel, "Any good Muslim who is living according to Allah's law and the Quran will never choose loyalty to their citizenship over loyalty to Islam." A true follower of Islam thinks his job as a believer is to make the whole world Muslim. Islam is his nation. I recently watched a documentary made in 1993 showing Islamic organizations in the United States raising money for humanitarian causes like children, refugees, and hospitals, but the money was really paying for guns and plastic explosives. These humanitarian organizations were a front to fund terrorism. Kind-hearted American citizens gave money, thinking they were helping poor children, but actually they were paying for weapons to be used against American citizens. This lends evidence to what Gabriel says in his book — if someone is following the instructions in the Koran, fooling unbelievers and using trickery is perfectly legitimate. This is war. Gabriel writes, "Islam does not acknowledge or respect human rights, women's rights or democracy. All these are Western ideas from infidels; therefore Muslims do not acknowledge them." This is probably an overstatement, but what do I know? I live in the United States. Gabriel was born and raised in Egypt as a Muslim and has a degree in Islamic history from a Muslim university. Freedom of speech isn't well tolerated by Islamic states. That's an understatement. Places like Iran and Saudi Arabia, where they really try to follow the Koran to the letter, are extremely, unbelievably intolerant of free speech. The leader of Iran is the one who threatened Salman Rushdie with death when Rushdie's book, The Satanic Verses, was published. And Rushdie didn't even live in Iran. Islam is a revolutionary faith that comes to destroy any government made by man. The goal of Islam is to rule the entire world and submit all of mankind to rule by Islamic law. Any nation or power in this world that tries to get in the way of that goal, Islam will fight and destroy. One of the most interesting chapters of Gabriel's book is called The Three Stages of Jihad. These stages are spelled out in the Koran. In the first stage, when Muslims are a small minority in the country, they work to increase their numbers. So they preach love and compassion, hand out literature, try to convert others, have lots of babies, help their Muslim relatives immigrate from other countries — whatever increases the number of Muslims in the new country. The second stage comes when they are still a minority but gaining some influence. At this stage, they make preparations for eventual conflict. They build up their money, their political clout, their connections, and their equipment, while trying not to let the unbelievers know what they're up to. The third stage is open conflict. "This stage," wrote Gabriel, "is when Muslims are a minority with strength, influence and power. At this stage every Muslim's duty is to actively fight the enemy, overturning the system of the non-Muslim country and establishing Islamic authority." That is the formula for the gradual takeover of a country. The plan is already in operation in most countries of the world. There are three ways for Muslims to seize control of a government. One is the gradual way above. The second way is for a powerful Islamic state to wage war on the non-Muslim country, defeat it and submit it to Islamic law. The third way is to do what Syria, Saudi Arabia, and Iran are now doing in Iraq — sending men, weapons, and money into an unstable country, and trying everything possible to make the new government an Islamic one. Lying and deceit are acceptable in war, according to the Koran. This is something that perplexes Westerners and makes Islam difficult to understand because most people in the free world don't realize that in Islam, war is a religious activity. War is an act of worship. So lying to the enemy is not at all immoral. All is fair in war. With their influence on the media, and their enthusiasm for deceiving, terrorists have successfully buffaloed and confused the majority of Europeans and Americans. That's why I urge you to help make this information widespread in the West. When a lot of people understand what the terrorists are doing, it reduces their effectiveness. Gabriel writes, "Muslims are very good at presenting themselves as loving, caring and forgiving people. They compromise any conflict between the image they want to present and what they truly believe...They get along with Christians and Jews as if they were brothers. They present Islam to these countries as the answer to all humanity's problems. These Westernized Muslims present their religion as if it stands for mercy, freedom, fairness and reconciliation. They portray Islam as a religion that does not show prejudice to any race or culture." Another thing that baffles Westerners is Muslims' use of mosques for storing weapons. But that's because we think a mosque is basically like a church or temple. It serves a different function in Islamic practice because jihad is one of the most important practices of Islam. Using a mosque to support jihad is perfectly acceptable to Muslim fundamentalists. It is not profane at all. In fact, it is a good and holy use of a mosque. It's an added bonus for the jihadists that Western soldiers are so reluctant to bomb a place of worship. Islam is a revolutionary religion. The Koran commands its faithful to take over governments. In the Sudan, an Islamic extremist — Al Turabi — has succeeded in gaining power. The main resistance he got was from a Christian minority in south Sudan. "Al Turabi is getting rid of them," says Gabriel, "Al-Turabi is slaughtering the Christians, cutting off their hands and legs, injecting them with the HIV virus — just as Islam taught him. He is showing the world what Islam will to to Christians if it can." No, it does not say in the Koran to inject infidels with HIV. Or at least I haven't gotten to that part yet. But it does say to cut off one arm and the opposite leg. Algeria had an election in 1991 and by tricky maneuvering, the Islamic Salvation Front won the election. But everybody knew what would happen if they were allowed to take power. So the military shut down the election. The country erupted in violence and more than 150,000 people were killed to prevent Islamic fundamentalists from taking over the government. These are Muslims fighting to prevent the takeover. It is moderate Muslims who want to practice the peaceful parts of the Koran and ignore the violent and intolerant parts — it is those moderate Muslims fighting the extremist Muslims. This is an insight into the true nature of the situation — not all Muslims want to follow the Koran to the letter. They were born and raised Muslim. They had no choice about that. Most Muslims want to live in peace, just like the rest of their fellow human beings. They want human rights, and they are willing to fight their fellow Muslims to earn it, so don't get too demoralized by these insights into Islam. Gabriel said something has changed in Islamic movements. They used to think they should first take over their own government, then use it as a base to take over other governments. That is Iran's philosophy. But the extremists have encountered so much resistance in countries like Egypt that they have changed their strategy. They decided to go for a worldwide jihad. "They decided to go after the 'head' rather than the 'hands,'" writes Gabriel, "The head was identified by its political policies. America and Europe supported Egypt to destroy Islamic sects; America supported Iraq to fight the fundamentalists of the Iranian revolution; and America is still supporting Israel to fight Palestine." America is the head, and that's who they're targeting now. And now you know why. Read Islam and Terrorism and then loan it out to your friends. Send this article to them. Let's get the word out about what's going on. This is not a few nutcases we can simply arrest. This is a global movement, driven by the religious fervor of a well-established religion, supported by lots of oil money and many national governments (Saudi Arabia, Syria, Iran, etc.). The free world will not be able to deal effectively with it until a large percentage of our population knows what we're dealing with. One way you can help is to get the word out. Sooner is better than later. If you feel you aren't an important enough person to make a difference, the first thing you need to do is correct your mistaken assumption. Start here. 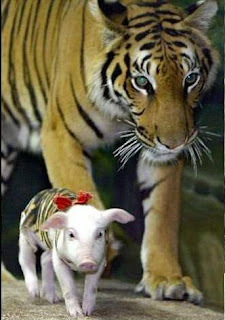 Someone sent around photos the other day of a female tiger that was nursing a bunch of piglets that were dressed up as baby tigers. And at the end of the email, it said, "Why can't the rest of us get along?" Well, since you asked, the rest of the world can't get along because there are people like the Islamists, who think God wants them to kill anyone who doesn't believe the way they do. As long as there are people (usually men) who are so damn sure they know the will of God that they are willing to create hell on earth to achieve heaven after death, well, there will never be any peace on Earth except when the good guys hold enough power to stop them. In short, you can't get along with people who don't want to get along with you. Happy Veterans Day... and I'm thankful for every damn one of them! It is easy for almost everyone to get along with almost everyone. But all you need is a few who aren't interested in getting along, and you've got a situation to deal with. And it seems likely, given how many people are on the planet and how many kinds of people there are, that there will always be at least some people who will not get along. It's a bummer, but it would be hard to argue with the truth of it. The best we can do is cooperate with the cooperators and limit the influence of the non-cooperators as much as we can.